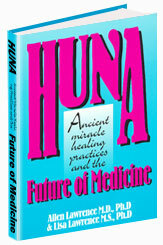 by Allen Lawrence M.D., Ph.D. & Lisa Lawrence M.S., Ph.D.
Huna, Ancient Miracle Healing Practices and The Future of Medicine is a revolutionary book which combines the recently discovered ancient healing system called HUNA with the sophistication and technology of modern medicine. This book describes these ancient mysteries universal to healing, which are now being proven by contemporary science. As the national controversy concerning the state of health care in America today continues to draw the attention of our government and individuals, there is a counter-movement gaining attention of ever increasing proportions. This involves the acceptance of traditional thinking about methods and concepts previously classified as "alternative medicine." Many such techniques have been with us for hundreds and even thousands of years. This book explores one of the most beneficial approaches that has direct applicability today in alleviating the stress-caused symptoms and afflictions of the modern world. For over two thousand years practitioners of Huna, the ancient Polynesian/Hawaiian healing teachings, have successfully emphasized the prevention of illness before it begins. To the Huna master, the mind and spirit are equal in importance to that which we call the body. This is in stark contrast with the western medical practices which generally treats symptoms rather than providing true healing. This book explains the salient concepts of Huna and points the way for readers to fully understand how Huna can be used to improve the quality of their health and to avoid illness. The Lawrences have applied this once secret knowledge of life and healing to the modern Western medical system. With the integration of Huna and modern medicine we now have a new revolutionary healing philosophy and a way of integrating psychology and spirituality into modern medical practice. In many ways this combined system parallels the new science of psychoneuroimmunobiology, integration of mind, body and spirit with modern medical practices. Even before there were hospitals or research labs, there were healers, shamans and wise men. These ancients healers were the scientist and doctors of their day, able to heal in ways which are now foreign to our present institutions. Using Huna's "secret healing principles," the Lawrences now add a whole new dimension to health care. It transforms medical treatments from simply using drugs and surgery into an integrated and complimentary process for healing the whole person. The integration of modern medicine with Huna's secret wisdom allows for healing body, mind and spirit at a level only dreamed of in recent times. The main focus of the Lawrence's book is to help you, the reader, to seamlessly add Huna and its new wisdom into your ongoing medical treatment program. 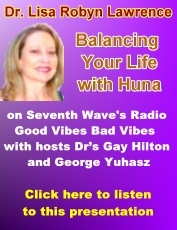 At the same time, Huna principles significantly improve your ability to heal yourself. For those of you who are not ill, you can quickly learn to use Huna techniques to prevent yourself and your family members from ever becoming ill in the first place. Both Books Have A 30 Days 100% Money Back Guarantee! Click Above and Order Now! Copyright 2006 © Allco Medical Enterprises, Inc. and Allen Lawrence, M.D., Ph.D. and Lisa Robyn Lawrence, M.S., Ph.D.